Orders with a shipping address outside of the European Union will have 20% VAT automatically deducted from their order during checkout once a valid address has been entered. Additional fees (tax, customs, import duties) may be levied by local governing authorities. These costs shall be borne by the customer. All items are shipped from Paris, France with an official declaration of the total price and country of origin for each item. 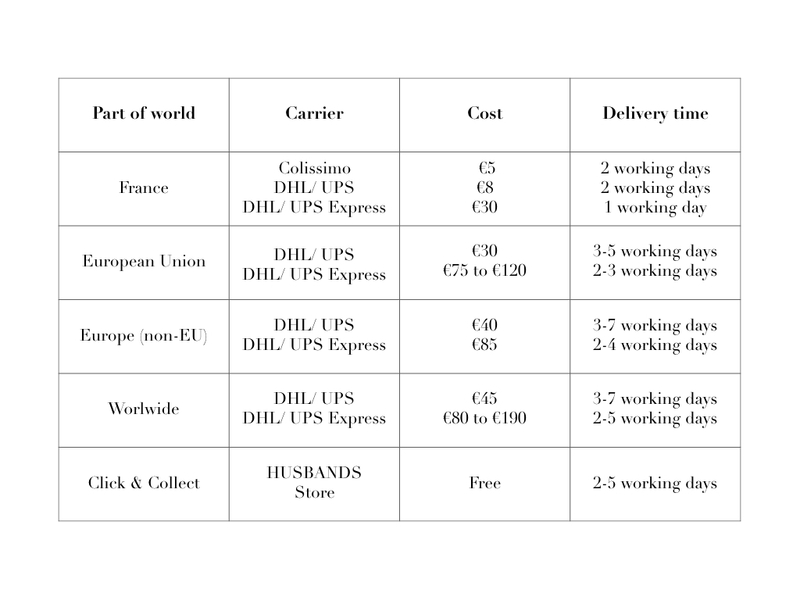 HUSBANDS offers shipping to France with Colissimo and to the rest of the world with DHL/ UPS. Estimated shipping times are in addition to processing times. Orders are typically processed within 2-4 business days. Please note, processing times may be slightly longer during sale and holiday periods. The Husbands store in Paris offers the Click & collect service for free on any order. Choose the « ship to store » at checkout. You have 14 days from receiving your order is ready to collect’ email to return the item to a store. We hope that you will be totally satisfied with anything you buy from our website. The item must be new, unworn items which are in their original packaging with all original tags attached may be returned to HUSBANDS within 14 days of receipt for refund. If goods are faulty/damaged, we are happy to either refund in full or exchange subject to stock availability. All items which you wish to return must be returned in their original packaging (or equivalent) with their labels intact. Please note, a refund will be issued via original payment method within two weeks of our receipt of the item(s). PayPal refunds may take up to thirty days and are subject to PayPal refund regulations. Please allow seven days from receipt of goods for the refunds amount to show back on your card. We strongly advise all customers to check items thoroughly upon receipt before removing any attached tags or disposing of any original packaging. Please notify us immediately by email if you receive any item which is defective, damaged or missing original tags/packaging. A complimentary return Colissimo label will be provided for customers residing in France. Regrettably, customers outside France are expected to bear the costs incurred when returning an item. HUSBANDS cannot accept responsibility or compensate such costs. If you prefer, you may exchange the item (if in a resalable condition) for something else, this is however subject to stock availability. Please include original paperwork and clearly mark as « Return for Exchange » with details of the item you wish to exchange for. Please note, if you wish to exchange an item, you will have to pay any difference in cost and the additional delivery cost.